Palak Paneer is a delicious, hearty North Indian dish prepared with spinach and Indian cheese.Its my favorite one since my childhood.This is a very popular and served in every Indian restaurant. The creamy texture of spinach with paneer is a very good combination. Cut the green chillies into 2 or 3 pieces. Take a pan and heat with 1 tsp oil. Add green chillies and washed spinach . Sauté till the leaves are wilted. Leave it to cool for 5 mins. After 5 mins grind spinach and Green chillies to a fine paste. Now take a pan and heat with 1 tsp of ghee /Butter. Add Cumin seeds.After it starts to pop add chopped onions. Then add ginger garlic paste and coriander powder ,red chilli powder. Sauté till the raw smell disappears. Add spinach paste, tomato puree, a pinch of turmeric powder and cashew nut powder (if using). Add salt and adjust to taste.Add Sugar. Combine well and add little amount of water. Do not add too much of water. If you add too much of water then it spread like flooding river. Cook on medium heat for about 10mins or until flavors combines well. Just before switch off the stove add fried and soaked paneer cubes. Add malai, garam masala pwd and kasuri methi and mix well. Now palak paneer is ready. Boil tomato in hot water and peel the skin. Now mash or grind the tomatoes in mixer grinder without adding any water. Dry roast and make a fine powder. Sauté paneer cubes in 1 tsp of ghee or deep fry till they are golden brown and soak in warm water with pinch of salt for 10 mins. Yum! You're right that spinach and paneer go very well together. Paneer looks so so yumm. Even thoug i am not a huge fan of palak, i think i like this dish. I still have to send you my entry. Looks so delicious, I love Indian Cooking! Paneer and spinach together works out wonder...delicious palak paneer..
Mmm.. one of my favt sireesha! Good entry! 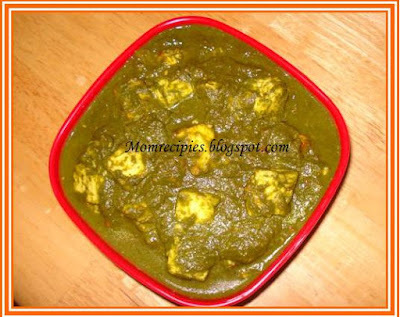 Palak paneer looks super and yummy. A all time fav. side dish with roti and naan looks so delicious and beautiful color. I havent tried this at home,i love to try ...looks mouthwatering! 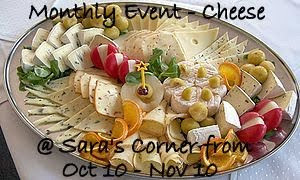 one of my fav too,..looks yum,..
Looks so yummy and creamy, great to have with roti!